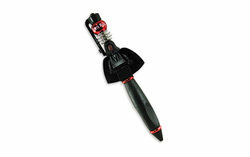 2851126 Darth Maul Pen is a Star Wars pen released in 2009. This is a description taken from LEGO.com. Please do not modify it. Customize your Darth Maul pen! The dreaded Darth Maul is just one of the collection of stylish Sith elements that you can connect, build and rebuild to customize your own unique LEGO Star Wars pen in any order you choose! Facts about "2851126 Darth Maul Pen"
This page was last edited on 9 January 2016, at 06:38.